Product #17467 | SKU SPARK DIGITAL | 0.0 (no ratings yet) Thanks for your rating! 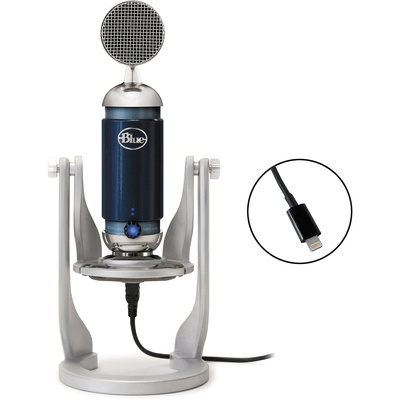 The Spark Digital Studio Condenser USB/Lightning Microphone by Blue is designed for driverless plug-and-play audio recording to a PC, Mac, or iPad (30-pin and Lightning connector versions or 30-pin version with available Lightning adapter) in applications such as music, voiceovers, and podcasting. The large diaphragm condenser Class-A circuit design is suitable for recording sounds such as vocals, drums, piano, speech, location sounds and more. The microphone connects to your PC or Mac via USB or to your 30-pin or Lightning connector iPad using the supplied y-connector cables with integrated zero-latency monitoring headphone jacks. It utilises a 16-bit 44.1 kHz analogue-to-digital convertor to record WAV and MP3 files on your computer or iPad using your DAW or recording application of choice. The front of the microphone body features on-board controls for volume, gain, and instant mute as well as an LED metre to provide visual feedback. The microphone features a Focus Control switch for either increased low frequency sensitivity in normal/off mode or greater clarity and detail in the treble range when the Focus Control is engaged. This circuit is not a simple low-pass or high-pass filter, but rather a switch to change the voltage loading of the input driver for the microphone capsule itself. This provides for an output signal that is uncoloured with different dynamic properties and a different frequency response to expand the versatility of the microphone. The unit comes with an adjustable desk stand with a built-in shockmount, a USB cable, and a Lightning cable. A 30-pin connector cable is available for older iOS devices (sold separately).